When Maxis announced the production of their third expansion, they told us that it would be the biggest one so far and enable The Sims to enter the dating scene. 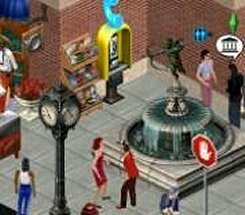 It would include 40 more interactions, 125 new objects and it would allow Sims to leave their neighbourhood to go downtown for their Hot Date. They were right and because of the amount that this review has to cover, this will be the longest of the three reviews on the Expansion Packs that I have written. In order to get a feel of it, here's an extract out of the journal of one of the Sims to tell us about it. I moved into my new home today. As it was the first house in this neighbourhood so I did not have any curious neighbours welcoming me to the area. I decided to look for a job later. I missed my Mum's cooking but she said I would be a quick learner so I spent a lot of the day following her recipes with the help of the new Boggs Canning Centre and made three six-jar boxes of marmalade. I could have sold them but instead chose to keep them and give them to any new friends that I would make. It was getting dark and I was hungry. I did not fancy cooking and as I hadn't seen anyone all day, I decided to see what Downtown was like. I had a shower, called the nearest taxi firm and quickly got changed before it arrived. My wardrobe was surprisingly well arranged and I quickly found what I was looking for. A bright yellow taxi arrived and the driver asked me where I wanted to go. I was spoilt for choice. I could have chosen Barrett's Boardwalk, Sim City Beach or Crumplebottom Memorial Park to name a few. Instead, I chose to go to Cory's Place. This was an open-air restaurant on Will Wright Way. I thought the Â§50 fare was alright but when the driver told me that charge was all around town, near or far, I thought it might be pricey in order to just go up the road. There were a lot of people milling around when I was dropped off outside the restaurant. I decided to take the plunge and introduce myself to one of them. I shook hands with a girl whose name was Jacinda. She was friendly and wore a bright red dress. I told her my name was Cathy. We were both into fashion and parties and had a mutual mistrust of politicians. As we were getting on so well, I asked her if she wanted to hang out with me. She agreed. The Maitre d' quickly found us a table and gave us our menus. The waiter came along shortly to take our order and while we were waiting to be served with our starters, a gypsy playing a violin serenaded us. We had a very good conversation about our interests and a good gossip about what was happening downtown. Jacinda said we should be cautious about gossiping about the restaurant staff or service. A couple she knew of had been overheard talking about what they thought was poor service and had been thrown out of the restaurant. After the dessert, I asked Jacinda how she was. She said she was after some fun. Cory's Restaurant might be a good place to eat but there wasn't much action. I called the taxi from one of the public callboxes and asked it to take us to another part of downtown. That "near or far" fare of Â§50 now seemed a bit expensive. She was right about Old Farm Square. The Mechanical Bull cost Â§45 to ride and I gave it a go. I nearly got thrown, but I'd been to one of Julia Valentino's House Parties and had some practice so I stayed on. There was an old lady who was the downtown janitor. She kept getting under my feet when I needed to go to the powder room. Jacinda told me a prudish old lady who made the romantic life of couples very difficult, but hadn't been seen recently. We had a few rounds of drinks and strutted our stuff on the dance floor and I got phone numbers from three of the guys. There were couples slow-dancing and others were hugging in a romantic manner. Well, a romance for me could come later. However, all good things had to come to an end. I was tired and Jacinda also said she needed her bed. She said that we must go shopping sometime and recommended the Landgraab Mall on Main Street. Before I hugged her goodbye, I gave her a box of preserves that I had made earlier. She was pleased. I ordered another taxi from the callbox and it arrived shortly. I got home to find things exactly as I had left them. Even the clock said the same time. I could not be bothered thinking about relativity at that time. My funds were now fairly low and I had to find a job tomorrow as I was spent up. It looked almost as if time had not passed but I did not have time to think of the relativity of things. I immediately went straight to bed and was already asleep before my head hit the pillow. This excerpt from Cathy's diary mentions only part of what Hot Date has to offer but like visiting a new place, it is impossible to take in everything at once. Cathy and Jacinda had many similar interests. If their interests had been different, Cathy could have bought one of five magazines to read up about Jacinda's interests so they could have more in common and more to talk about. She mentioned the Crumplebottom Memorial Park. If she had called there instead of the Old Farm Square, she could fed the fish, raced boats that she could have hired from the rental shack or had a picnic with a special someone. Cory's Place did not have any dining booths. If Cathy goes out on a date with one of the guys she got the phone number of, a different choice of restaurant might be an idea. You can get more intimate in these booths than sat opposite each other at a table. Cathy mentioned some of the new interactions such as slow dancing, talking about interests and hanging out. These are only a few of the new interactions that Sims can do. So how does Hot Date load up? The booklet recommended I scandisk defrag my HDD which I did. Hot Date installed with no problem. During installation, it detected I had House Party already installed and asked for the HP disk during the process to update some files. During loading, there are not many changes. There is a 3-second clip of a silhouetted couple kissing under the moon tacked on the beginning on the familiar introductory video. I would have thought that the changes from this Expansion would have warranted a new AVI to replace the old one that was made even before the original game was even launched. The usual Sim-blue loading screen is now what I suppose I should call Sim-red and the game loads up in the usual manner. When the game has loaded, we are presented with the usual neighbourhood screen with some small changes. There is a Sim-blue bar along the top of the screen with the old familiar buttons plus a new button that allows the player to edit downtown lots. What's new for your Sims? Relationships are now assessed on a long-term and short-term basis and the interactions that are available depend upon a combination of these and sometimes other factors. For instance, you can be in a good long-term relationship rating with someone but have got out of bed the wrong side and your short-term is low. You can now "Nag" your partner about different subjects. Interests have been increased from six to fifteen and like skills you have levels in each of these. A new box on the display allows you to see the levels are. These ratings can be changed through reading magazines that can only be bought downtown but the side effect is that when one interest level goes up, another one can come down. You can't be an expert in everything but I suppose that is true to life. The new Inventory box is for items that you buy downtown or make so you can give them to people. If you have "Living It Up/Living Large", you can add gnomes that you have made to this list. A new object allows you to make homemade preserves and also helps you to increase your Cooking Skill at the same time. Once you let your Sims interact with each other, you will notice more changes. I will not describe all the interactions available but there are more kissing and hugging options available for a start. If you talk to someone, you have the choice of talking about interests or having a gossip about people. In Buy Mode, you will find the different sections have sub categories. If you are crying out for your user-created objects, look under the infinite category that includes everything. 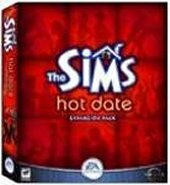 The Sims Hot Date Organiser can be downloaded from the official site and allows you to sort your user-created objects, make some of them available downtown and make you feel happy. As well as the Boggs Canning Centre that helps you improve your cooking skill, there are new single beds, chairs, coffee tables, counters and many more. I am yet to try out the new Love Tub as the price is rather steep, but it does look good. There are also new objects in Build Mode. Basically, there is more of everything. Okay, there are not any more roof textures, but you can now have flat roofs. However, I found it hard to get a roof texture that looks right. No gable-ended roofs, though. I suppose I can live in hope. The water tool can be accessed directly and a new tool allows you to allow your grass to grow or look trodden. The biggest change, however, is not in the neighbourhood. "When you're alone and feeling lonely you can always go -- Downtown"
The default downtown took a few minutes to load up and consists of ten lots of which nine have pre-made buildings in them. The lots are varied and well designed and looking around gives you an idea on commercial building design. Designing downtown lots is very similar to designing houses although it will take you a lot longer due to the size of the lots. You cannot edit in Downtown when you are playing so it is important that when you design lots you make sure there is plenty of space for your NPCs and Sims to get around. In Buy Mode, objects are organised into Dining, Shopping, Street, Outside and Other. There are subclasses under these that are appropriate to the type of building that you say you are working on. Often, these overlap. Before you start using TSHDO (The Sims Hot Date Organizer), you will only see default objects in these categories. Build Mode, however, does include user objects. Don't ask me why. How easy is it to make friends now? I have to say that it is harder, but more realistic, more challenging and more fun all at the same time. The best place to make friends is hanging out downtown. After all, if you want to impress a new girl (or guy), you won't invite her over to watch "The Simpsons" and sample your mediocre cooking. You'd take her - or him - somewhere special where they don't feel obliged to do the washing up. Apparently not. They cannot go on their own and I haven't been able to invite them. There should have been more for children to do. Is it bug free (and I don't mean cockroaches)? I will not say that the game originally played bug-free for me. I had a few problems. 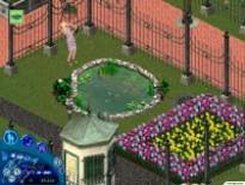 Firstly, my adult Sims could not get the carpool to go to work. Secondly, the game unnecessarily put a mailbox and trashcan on every downtown lot and sometimes in awkward places. Thirdly, I could not invite anyone to go Downtown with me, either from home or inviting friends. However, I was able to quickly rectify these. If readers have these problems, email me and I will tell you how I fixed mine or perhaps we might put a Hot Date FAQ on the site. What happened to the old prude? Apparently, she was dropped at the 11th Hour. Don't ask me why, but ingenious fans have been able to bring her to life. Read our past news section for details as to where. However, Claire the Bear is worth looking out for, both downtown and rummaging through your trash. Okay, I admit it. I am hooked on "The Sims" but I can see what this adds to the game for those who haven't become addicted and perhaps disillusioned. "The Sims" is now more realistic, more immersing, more challenging and more fun. Yes, Hot Date is hot stuff. If you'll excuse me, I've just ordered a cab to take me downtown to "The Black Bear Bar" for a few drinks and a game of darts. Written at 02:36 on Thursday 13 December 2001 by Andy.